Vineyards: South/Southwestern exposure at 200-550 m (650-1800 ft) ft above sea level. Winemaking Notes: Vinification: The grapes are hand-picked and after de-stemming and crushing are subjected to fermentation for a period of 12 days followed by malolactic fermentation. 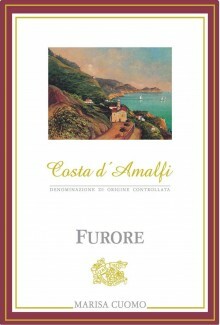 Tasting Notes: Color: The Furore Rosso Riserva is an essence of ink in color with Bordeaux red hues. Bouquet: This colossal wine offers an intense nose of black fruits, leather, and game. Food Pairings: This aristocratic wine serves well pastas with rich sauces, roasted leg of lamb, seared beef tenderloin with mustard-horseradish sauce, spiced pork tenderloin and braised shallots and/or aged cheeses.